1. Flowerbeds where you want a bit of a uniform color, but you don’t want to use mulch is a great place for crushed stone. 2. If you want a decorative driveway, but don’t want gravel, crushed stone is a perfect thing for your driveway. Crushed stone looks more angular instead of round, so it’s just more decorative and will set off your driveway better than gravel. 3. Crushed stone is great in paving blocks and concrete for sidewalks. It provides a base and looks great. 4. If you have an area of your yard where the water doesn’t drain the way you would like, add some crushed stone as a decorative feature. The stone will help the water drain and not puddle while providing some decoration. 5. Anytime you want a walkway that is unique, you can put borders down and fill it with crushed stone. It will look different than using flagstone and will become a unique feature of your landscape. 6. If you are going to add a fire pit to your backyard, use crushed stone to provide a safe sitting area around the fire pit. It protects against fire spreading and at the same time looks comfortable and gives your landscape a bit of a beach feel. 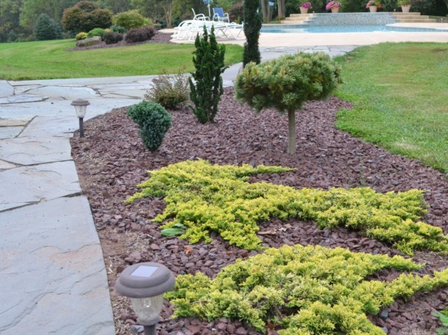 Interested in more ways you can use crushed stone in your landscaping? Take a look at your ground cover and see if crushed stone might be right for your yard. When it comes to deciding on a ground cover for your yard, you have plenty of options to choose from. However, making the right choice depends on your specific wants and needs. Fortunately, crushed stone makes an excellent groundcover for most homeowners due to some of its major advantages. When you use crushed stone properly, you can direct water that is heading to the foundation of your home elsewhere. You can avoid having to spend a lot of money on foundation-related repairs later on, and this can be done just by investing in crushed stone. A major advantage of crushed stone is that it does not decay, so you do not have to worry about replacing theground coverr like you would for wood chips. It is very low-maintenance, which makes it a great choice for those who have an extensive garden and already do a lot of work or for those who want to have a yard that requires the least amount of maintenance as possible. Dealing with pests on your property that get into your garden or your home can be a hassle. Whether you do your own pest control or decide to contact a professional is up to you, but it is time-consuming and can be expensive depending on the types of pests that infest your yard. Although there are effective solutions to keeping pests away from your property, these methods often include chemicals that you may not want around your home. Fortunately, you can use crushed stone as a natural form of pest control, as long as the stone is placed properly to deter pests. Many pests eat your plants, whether they are flowers, shrubs, herbs, vegetables, or fruits, and you should attempt to preserve the health of your plants by surrounding them with crushed stone. Although some pests will still find their way onto plants, many pests will be deterred by the crushed stone and leave. It is ideal to create a border around your property, especially where greenery meets on the property line. For instance, living next to a forest means you should surround your backyard with a border of crushed stone, which will deter pests from getting into your yard. Since a lot of pests are attracted to moisture, an excellent idea is to keep your property as dry as possible. Unfortunately, some yards have a landscape that promotes moisture, but it can be fixed by using crushed stone to direct the path of water when it rains, comes down the gutter, or falls from the roof. An additional benefit of surrounding your yard with crushed stone is that it can serve as a barrier to water that would otherwise get onto your property and could cause problems like water seeping into your basement. It happens even to the best and newest homes: wet basements. Water pooling in your home’s basement, caused by poor drainage or hydrostatic pressure, is a concern for all homeowners, not to mention very expensive for a professional to completely fix. So while the final solution is a total rip out and reinstall, there is a handy way of curbing a wet basement by employing some ingenuity and some crushed stone. As water finds its way into your home, it’s often difficult to find the source. There are many ways for entry to occur. So in order to remand all entry, the most comprehensive way is to use the trench method (or in some instances, the French drain). A trench is dug all the way around the perimeter of the basement floor, working as a collection source for wayward, unwanted water. It is then filled with crushed stone and drain pipe (then sometimes more crushed stone). Then a collection system is installed — there are many types, which one you choose will depend on your situation. The water collects in the trench, trickles through the stone, and is expunged through the pipe. A sump pump is installed to add extra force in removal. Problems sometimes arise in older homes where the foundation is eroding away. In which case a professional will have to work the ground up with fabricated brick, stone, dirt and extra crushed stone. It should also be noted that while this method works wonders, for some homes, it is not an appropriate solution. A waterproofing contractor will need to be called in extreme situations where foundations are questionable and basement water problems are severe. In addition to being an integral part of your drainage solution, crushed stone can help you repair damage to your walkways and around your foundation caused by cold weather. We all know that winter brings colder weather, including ice and snow. You have probably already prepared your house, but have you prepared your walkways and around your foundation? If not, now is a great time. Take a few moments and walk outside while looking down at your feet. If you have pavers, look for areas where the ground has settled and there might be gaps between the pavers. If you have areas of gravel or crushed stone, there might be areas where the ground has settled and the stone is a little thin in spots. If you have a sidewalk, there might be a few cracks or areas along the side that you want filled in. There might be settling around your foundation where water and snow can gather and turn to ice, which can damage your foundation. If you see any of these things, now is the time to fix them before winter weather hits and makes them worse. It isn’t difficult with crushed stone. To fill in the gaps between pavers, or to fill in the thin spots in gravel or stone, or even to fill in areas of your sidewalk, we have some great crushed stone for you. Crushed stone will look great in all areas of your landscape and when we mix it with your existing landscape rock or stone, it won’t look like we just added it. It will look like it was always there. That means you don’t have to take all your landscape out and start over, which will save you money. So, why wait? Now is the perfect time to contact us.